From the front page of the NY Times Nov. 15, 1943. 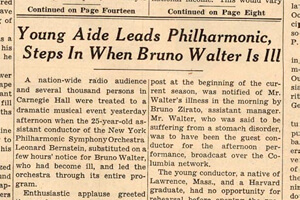 Sixty-nine years ago today, an unknown 25-year-old by the name of Leonard Bernstein was featured on the front page of the New York Times after making his debut with the New York Philharmonic, subbing in when the group's regular conductor fell ill. To this day, Bernstein's music is among the most popular to ever be performed by drum corps. In only four years since Drum Corps International's founding in 1972 has a Bernstein work not been featured by a junior drum and bugle corps in competition. The Garfield Cadets called upon the masterworks of Bernstein in each of their World Championship-winning shows between 1983 and 1985. After featuring selections from Mass in '83, the corps' wildly popular take on West Side Story in '84 would pave the way to 1985 when the Cadets mesmerized audiences expertly marching to the off-metered "Profanation" from Jeremiah Symphony, along with "Overture" (featured in the accompanying video clip) and "Make Our Garden Grow" from Candide.